Growing up in Shandong Province on the Eastern coast of China, Shaoyuan Tan always had a love for animals. Shaoyuan decided to pursue her bachelor's degree in Veterinary Medicine at China Agricultural University, a 5 year program, the fifth year of which is split between lab and vet clinic work. 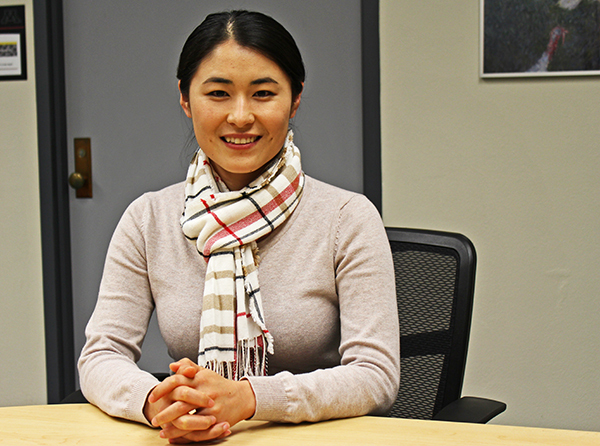 Tan found her passion in the lab conducting research, coming to the U of M to pursue her Ph.D. and she participated in a research rotation, eventually settling in the late Dr. Michael Murtaugh’s lab, studying new technologies in infectious disease diagnosis. Her Graduate Student Seminar Series presentation on October 18 was about a promising new genomic sequencing method, called MinION. MinION is a pocket size device that sequences DNA or RNA and then sends the information to a connected computer. Tan thinks that MinION will change the way we diagnose diseases, making sequencing cheaper, more accessible, and faster. Tan stresses the growing need for scientists who can understand and interpret sequencing data, in order to fully utilize the technology. Shaoyuan received a MNdrive global food fellowship last year, working with professionals from across the university to tackle global food challenges. She hopes to continue to work within the animal industry, using the interdisciplinary skills she’s learned to analyze large datasets and develop solutions to pressing large-scale issues.